When it’s time for your Oriental rug, your treasured family heirloom rug or your favorite area rug to be cleaned, you can’t put it into just anyone’s hands. Many so-called “expert” rug cleaners dip these extremely sensitive rugs into large vats of chemical solutions, where colors can bleed together and antique fibers can begin to dissolve. If you genuinely care about your rug, you’ll only trust Fort Worth’s rug cleaning experts: KIWI Services. Together with a master weaver, a senior rug cleaning expert and a rug repair expert, we’ll evaluate your rug so we can understand the perfect way to care for it. Our rug cleaning process involves a series of steps, including a thorough search for rips, tears and faded spots. We hand clean all rugs with our six-step process to ensure the highest quality clean. From pickup to delivery, you can trust KIWI with your rug cleaning in Fort Worth. 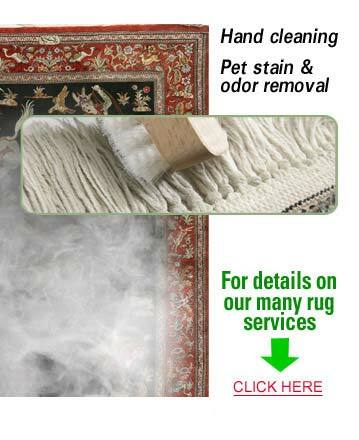 Many people assume that the musty, “old” smell associated with rugs is normal. However, that unpleasant smell is often caused by mildew and a buildup of dirt and dust, which can be harmful to your rug’s fibers. At KIWI, our team of professionals will remove all visible particles before tackling the larger issues; we do this because we want you and future generations to be able to enjoy your rug. We’ll pay special attention to any stains, including pet urine, and any soaked-in odors, such as smoke. Our innovative Ozone Treatment helps remove the toughest odors without damaging your rug’s delicate fibers. Call us at 817-585-5971 to find out how we can improve the look and feel of your rug through our innovative cleaning methods. Your rugs will look and smell new again, and you can rest assured that you’ll be enjoying them for years to come.